The Los Angeles Dodgers moved within a win of the MLB World Series after defeating the Milwaukee Brewers 5-2 in game five of the National League Championship Series. Milwaukee got creative to start the game with their pitching staff, but a brilliant start from a future Hall of Famer in Clayton Kershaw led the Dodgers to victory on Wednesday. The Dodgers lead the NLCS 3-2 ahead of game six in Milwaukee on Friday. Austin Barnes was probably the last person Dodgers fans thought would help their team win a postseason game. The backup catcher batted .205 with four home runs and 14 RBIs for the season and was one for seven in the playoffs coming into game five. But when Barnes stepped to the plate with Chris Taylor on third base and one out in the fourth inning, the utilityman came through as he grounded a single up the middle to tie the game. Barnes broke the Dodgers' 0 for seven streak with a runner on third and less than two outs in the NLCS while improving the team's batting average to .300 in the playoffs. And again, Barnes was literally the least likely person to come through in that situation. Barnes hit .111 with runners in scoring position for the season, which was last in MLB among players with 50 or more at-bats (319 qualifiers). The Brewers manager really was playing chess when everyone else was playing checkers on Wednesday. Craig Counsell allowed starter Wade Miley to pitch to one batter (a walk to Cody Bellinger) before he removed him for Brandon Woodruff with no outs in the first inning. But Counsell could not have predicted the effect that move would have later in the game. Barnes, who was in the line-up instead of Yasmani Grandal, drove in the tying run. Max Muncy, who was in the line-up because Los Angeles really did not have another choice, drove in the go-ahead run. Joc Pederson, who came into replace Freese after one at-bat, also tallied a base hit. Counsell attempted to control the Dodgers' line-up in game five, but as much as he tried to dictate the game by affecting Los Angeles' side, he could not keep them from scoring runs with moves he more or less forced. Kershaw has a reputation for being bad in the postseason, but let's look at this situation for what it is: Kershaw has good starts in the playoffs and he has bad ones, as well. He is not some terrible pitcher when the lights are brightest. Do not believe us? Kershaw has registered 12 quality starts (6 IP, 3 ER or fewer) in 22 career postseason opportunities. 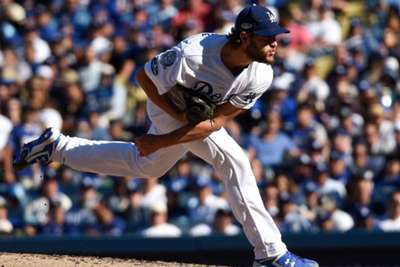 In eight of those 12 starts, Kershaw allowed one earned run or less in at least six innings of work. Kershaw has his bad starts yes, but he is not awful. He allowed one earned run in seven innings in game five. And while everyone loves to rag on him, think about this: The Dodgers ace has a better career postseason ERA (4.26) than Chris Sale (5.85), David Price (5.42), CC Sabathia (4.31) and Luis Severino (6.26). He is not far behind Corey Kluber (3.97). Kershaw gets a bad rap, but he should not be considered a bad postseason pitcher.